Top O’ the Morning to Ya Lassie ! Today was the beginning of a very busy fun week. 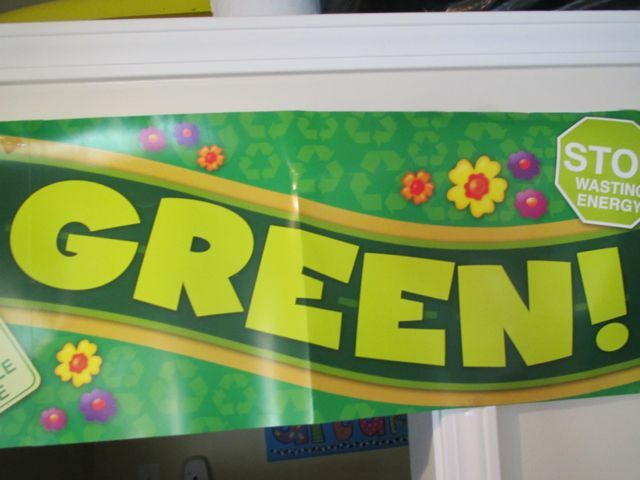 As the kids came in they began to notice all the GREEN around the room. Obviously our color focus this week will be green. 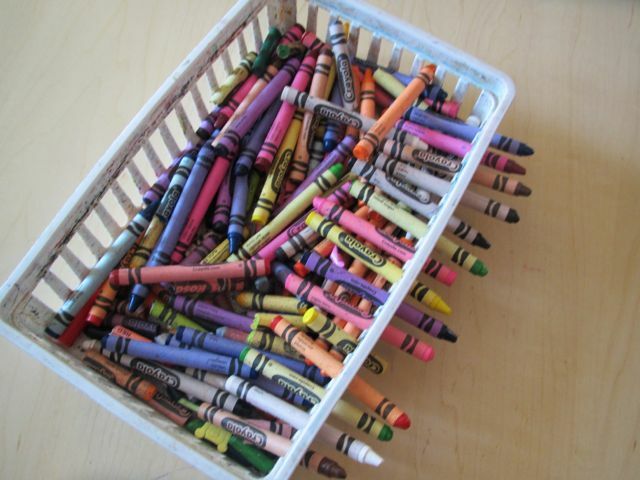 I can’t wait to read the book ” Little Yellow, Little Blue” that tells the story of how green is made later in the week. 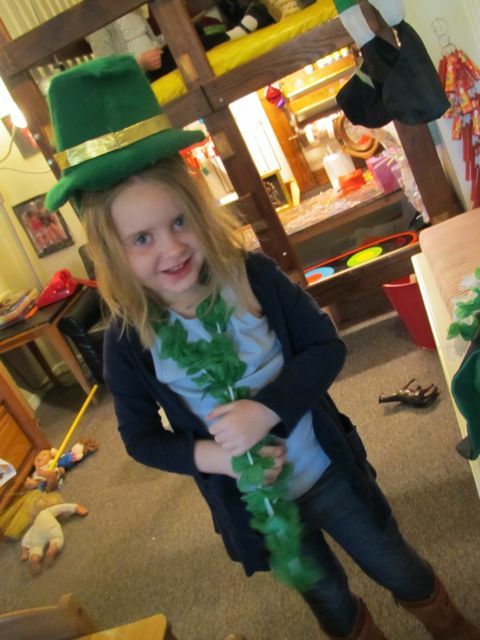 There were all kinds of green costume pieces around the room so the kids could get in the spirit. 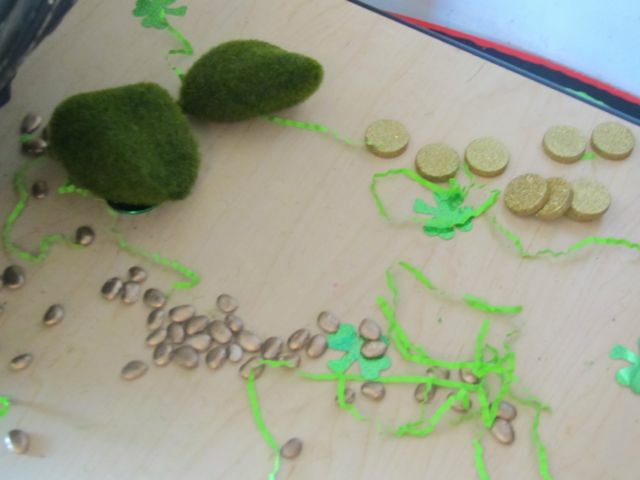 The sensory box had a lot of green things in it but a little gold hiding as well. Its a treasure hunt ! 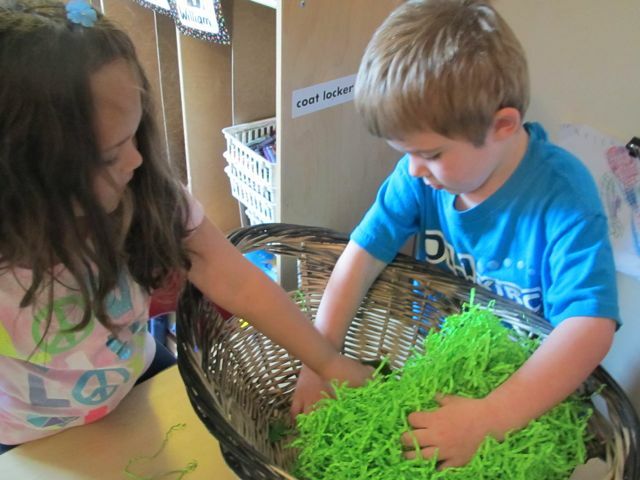 We did GREEN art. I asked the kids to create me an art piece just using green. 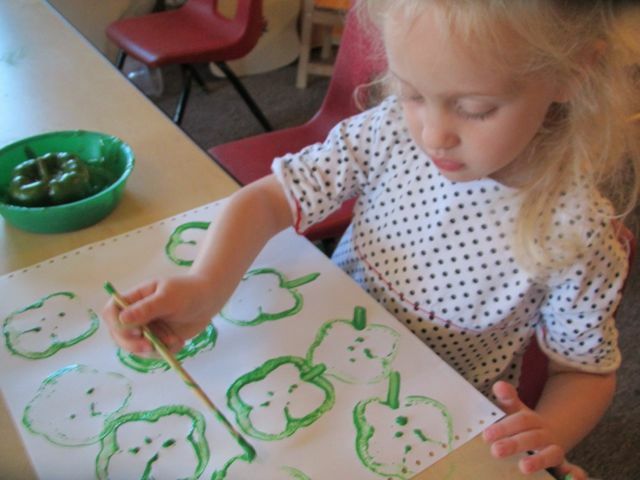 it is funny how some kids were inclined to draw something that is traditionally green – like broccoli. 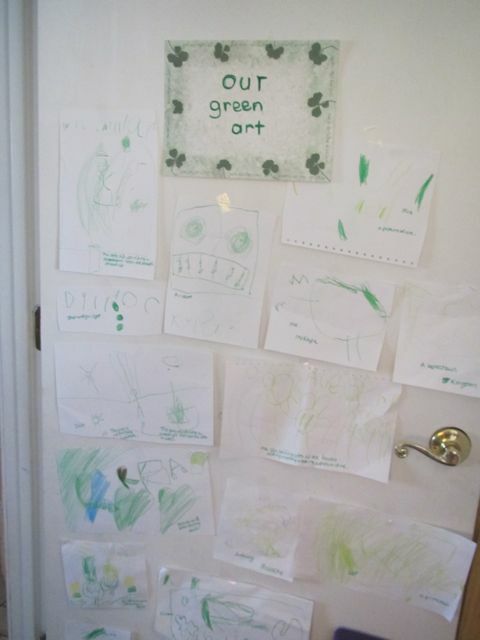 Others drew whatever they wanted — only it was green. Both are ok. 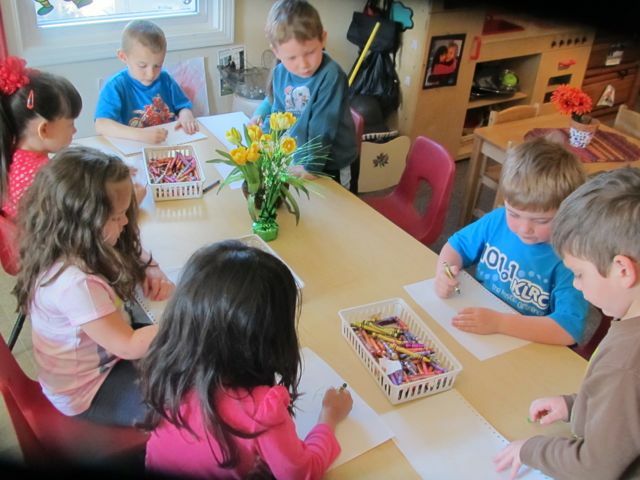 It definitely shows the personalities of the kids and who thinks in side the box and who thinks outside the box. What do you think I am.. in the box ? Or out ? Some of you might be surprised ! And when you have three year old boys who are not ready to spend time sitting at the table for more than 5 minutes coloring anything , green or not , this is what you get 🙂 But I can roll with this ! 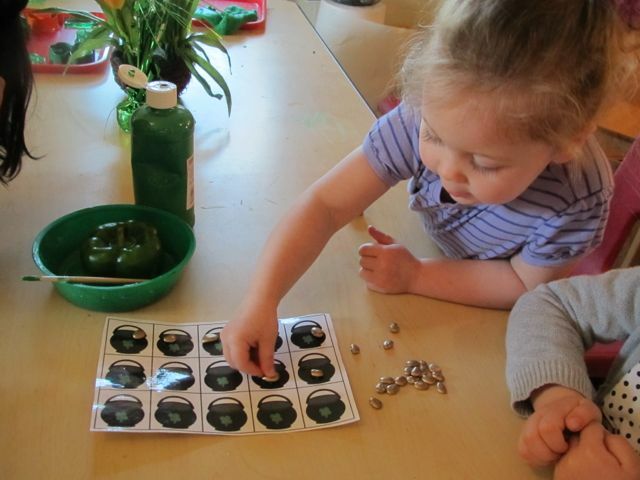 They gave me a picture and this activity was self directed and using fine motor skills to get the crayon on the hole and using math skills for one to one correlation. 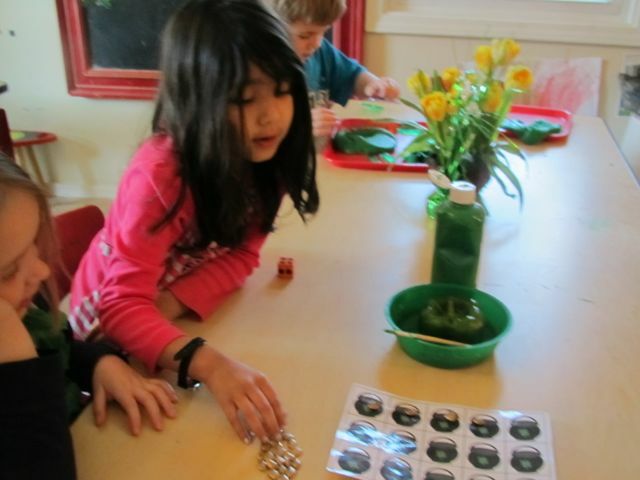 I introduced a math game that will be on the table tomorrow. Do you ever stick a toy out and the kids use it every way but the way it was intended ? 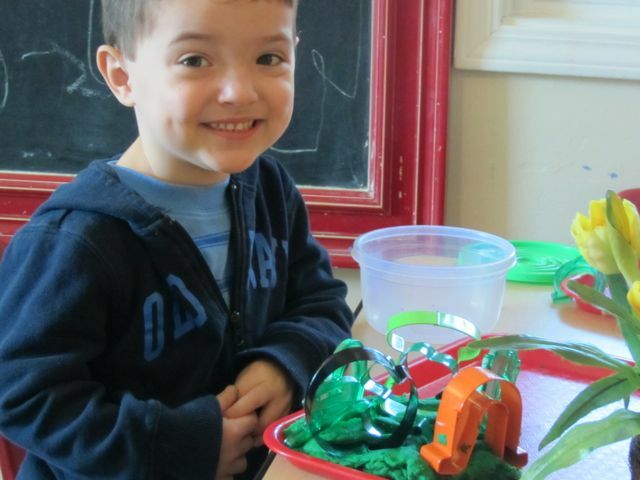 You can help that learning process if you first take the time to model and play with the toy with them. Many times we assume it is a no brainer how something is played and don’t understand why it gets broken so fast or the kids grow bored with it. It could be that they don’t know how to use it properly and feel unsuccessful and frustrated. Most kids can count to ten. Can yours hand you 6 objects when you ask for six ? Try it ! 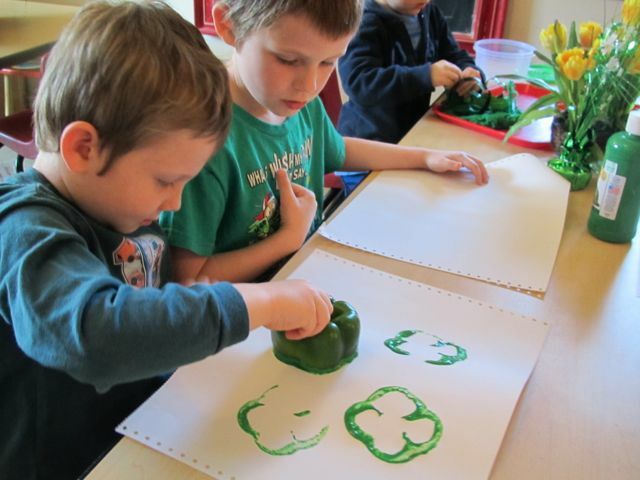 We used bell peppers to make shamrock prints. Are we gonna eat these ? I heard this more than once. 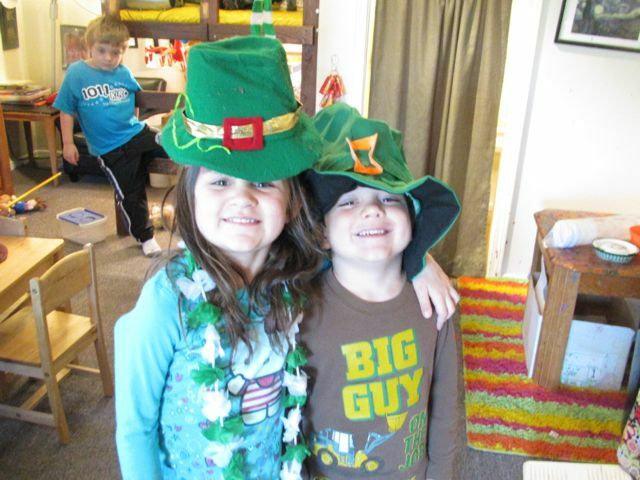 We learned who St Patrick is. Was he a leprechaun ? 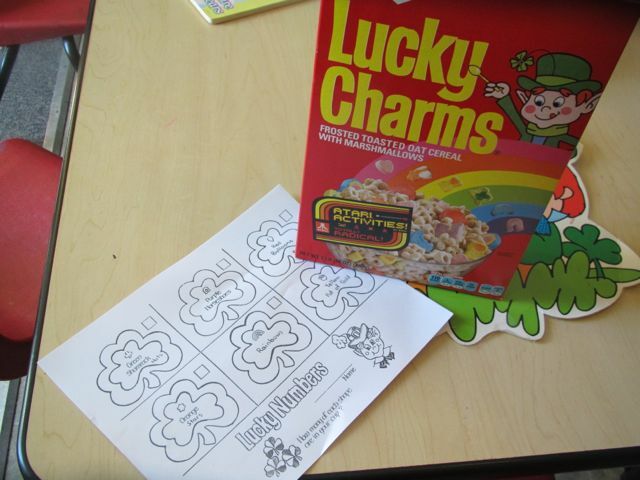 What has green and rainbows got to do with this holiday ? There is a new ruling that keeps us from using prayer in school that is not initiated by the children and ” teaching ” Christianity. ( Don’t get side tracked I will address this more later. ) 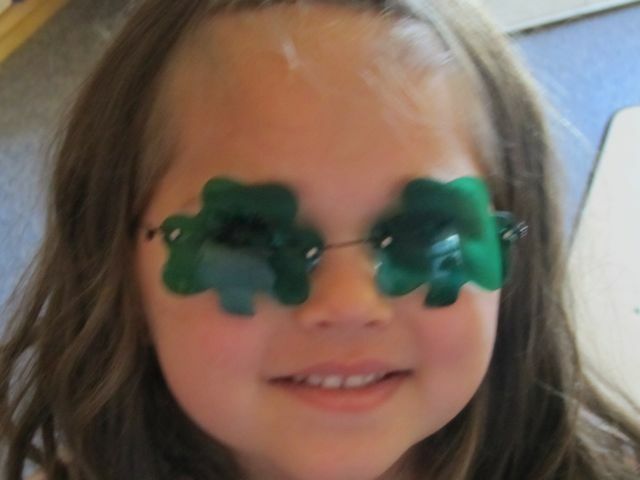 So, I was a little confused on how to introduce St Patricks Day since he was a saint…. hmm… It’s history, right ? 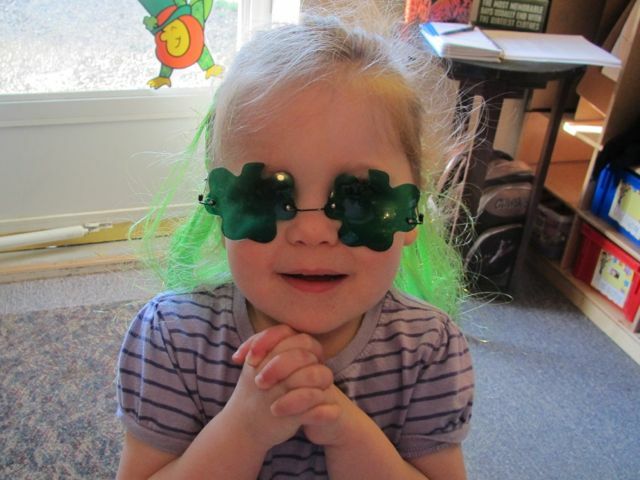 Here is a little clip from Veggie Tales that explains how St Patricks Day got started. 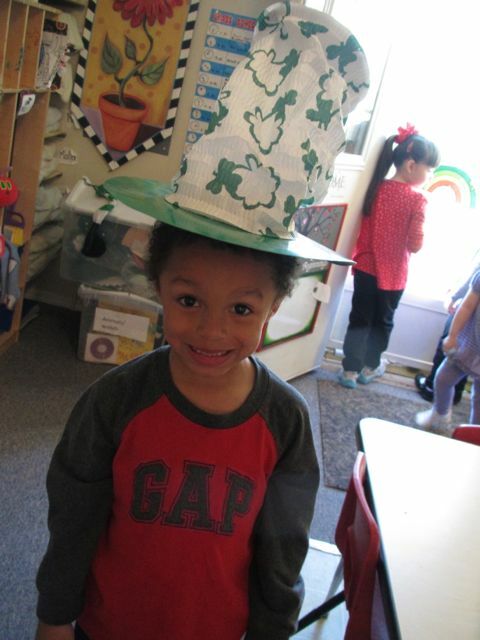 We listened to an Irish tune and danced a little jig ! 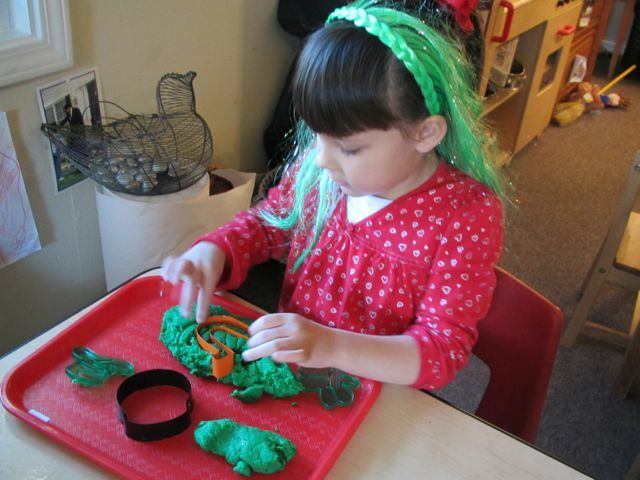 The kids loved the green playdoh I made last night. Do you want to make some for your home? Here is the no fail EASIEST recipe I use ! Pour ALL into a MICROWAVE-safe bowl and stir. Stop and scrape/stir the bowl. Microwave for another 3 min. It should be ready for kneading now. If not, cook for another minute or so!